DA Form 2806 or the "Physical Security Survey Report" is a Department of the Army-issued form used by and within the United States Military. The form - often incorrectly referred to as the DD form 2806 - was last revised on May 1, 2010. 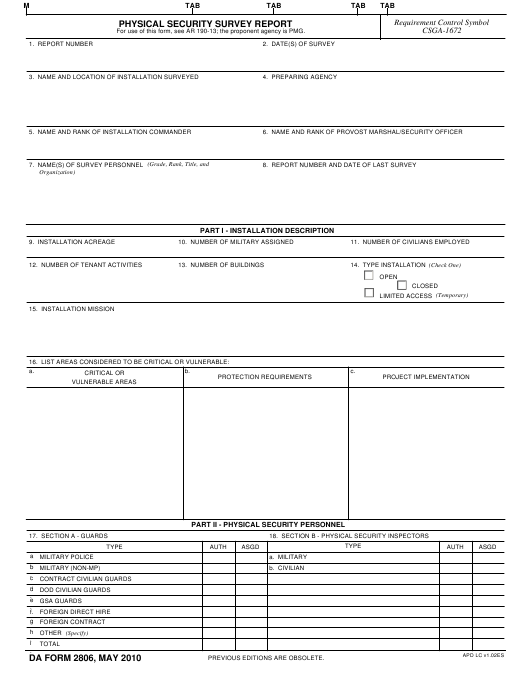 Download an up-to-date fillable DA Form 2806 down below in PDF-format or look it up on the Army Publishing Directorate website. For use of this form, see AR 190-13; the proponent agency is PMG. 19. HAS AN INSTALLATION PHYSICAL SECURITY THREAT STATEMENT BEEN PREPARED? 20. HAVE SUBORDINATE UNITS OR TENANT ACTIVITIES BEEN PROVIDED A COPY? 21. IS THERE AN INSTALLATION PHYSICAL SECURITY PLAN? 23. IS PHYSICAL SECURITY INCLUDED IN INSTALLATION CONTINGENCY AND EXERCISE PLANS?